There's quite a few products out there now based on Ganesha Games award winning Song of Blades and Heroes rules, most of which have been new games published by Ganesha Games. But Song of our Ancestors (SOA) is not only one of the latest Song of Blades ruleset-driven titles (based off Flying Lead mostly), but it's one of the first games published by a company outside of the Ganesha Games stable. 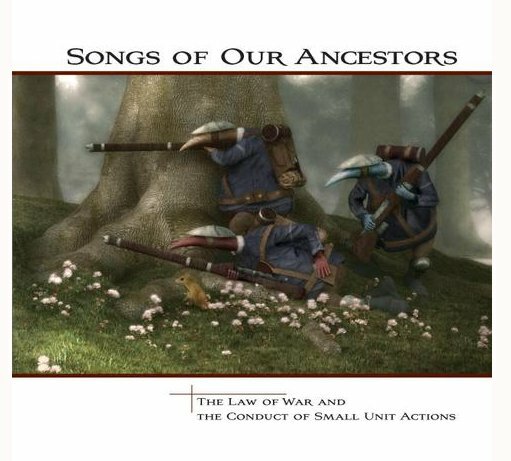 Zombiesmith is responsible for Song of our Ancestors, and they're also responsible for Quar, which is the race of the primary combatants depicted in SOA. Quar is a race of somewhat cute little beings that have been at war for over 700 years. There's an entire in-depth back story for them too. They were created by Joshua Qualtieri, who's a little bit artist and writer both, and just so happens to own Zombiesmith as well. The Quar is also set within a world that looks as if they didn't get past our WWI-era technology. There's a lot of similarities to WWI tech to be found when looking at a Quar right down to the uniforms and weapons. They almost look like something ripped right of out of Pink Floyd: The Wall as well, but more unique, with more character, because they're not quite as warped or gritty as the stuff in cartoon sequences of The Wall. An entire line of Quar models exist in 28mm scale and the all new 15mm scale, and both scales have quite a dedicated following. It's almost as if Quar has an underground or almost cult-status-like following. Because you don't usually hear a lot about Quar, but once you find someone who's into it, you can see instantly that those who are into Quar are very passionate about it, and can't get enough of it. 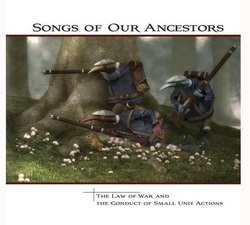 Song of our Ancestors is a 109 page softcover rulebook and has a very unique size, because it's a perfect square that's 8.5-inches X 8.5-inches. It's also printed in full color. With Mr. Qualtieri being an artist his talents are put to good use, because the book is lavishly decorated from cover to cover with various images of the Quar, and the world in which Quar live. Some of artwork in many places has a comic strip feel to it, because while they may be depicting war, it's done in a lighthearted way, not with brutality and imagery of dirty gritty war at it's worst. You sometimes get the feeling you're taking a peek into their world when they're not looking too, and catching them totally being themselves. One image in particular has two Quar sitting around a campfire, both cooking some sort of animal on a stick, and behind them is another Quar looking in his backpack for something that's evidently not there. It's clear that the other two at the campfire swiped his food and are cooking it now. Another memorable image has a Quar dressed up like a gas station attendant, and from the gas pump he's filling up the flame thrower tank that's on the back of another Quar carrying a flame thrower. It's so innocent and Norman Rockwell-like in presentation. This guy is REALLY good, and the imagery throughout the entire book is equally as amazing. As for the game itself, well if you've played Song of Blades and Heroes, or the later versions with some tweaks and updates to the system like Fear and Faith, then picking this game up should be a piece of cake. This is essentially the same game, with some minor rule tweaks. The most obvious difference is that it's all about Quar, and all of the weapons and special abilities are fine tuned to Quar universe specifications. All units (models) have a Combat value and Quality value. The average Quar starts with a standard Quality value of 4, and Combat value of 2. Those are the most vital and almost the only stats you need to remember. Aside from those two values there's a points-cost to include a unit into your Quar army, the name of the unit, and there's also Special Abilities and any Equipment the unit may have to list in the profile. Most Special Abilities and Equipment offer some sort of bonus modifier, further enhancing the Quality or Combat values as well. Measuring movement and ranges is handled via measuring sticks. You can also choose to play SOA in 15mm or 28mm scale, and if you want to use MM or Inches. For 28mm scale gaming the Short stick is 75mm/3-inches, the Medium stick is 120mm or 5-inches and the Long stick is cut at 150mm or 7-inches. If you opted for 15mm scale, it's 50mm/80mm/120mm sticks. Again this is the same as any of the Ganesha Games, so if you already have sticks set aside for Song of Blades and Heroes, Flying Lead, or Fear and Faith they should be just fine to use in SOA as well. Which side that starts a game is determined by a roll off. Just like the other Ganesha Games as well, the activations you're given per turn is decided by rolling 1, 2 or 3 D6 dice. Every D6 you roll which meets or exceeds your Quality value grants an action. The choice is yours how many dice you roll. However if you ever fail two activation rolls, then your turn is over and the other player becomes the Active Player. If they continue to roll successfully for their Activations, the Active Player can essentially activate all of their models before the other player can do anything. Once all of their models have Activated, then the other player can begin rolling for Activations again, but if they rolled two or even three D6, and right from the start failed two dice, then their turn is over already, and it's again passed over to the other player, who is now the Active player once again. That's the absolute worst case scenario, and I'm yet to see that occur. Also if you have mostly Average Quar in your army, chances are you'll be failing a lot of Activation rolls, because they have a Q4 value, meaning they need to roll a 4+ on a D6 to pass each die. Therefore the entire Activation mechanic does manage to keep things quite random, and it keeps gameplay interesting to say the least. Action cost is 1 for moving, and you can move up to three times if you wanted to and do nothing else, that is if you have 3 actions to work with. Attacking via range or melee is 1 action, an Aimed or Burst Shot tho is 2 actions, to Unjam a weapon is 2 actions, and to go into Overwatch is 2 actions, just to name a few of the costs. Any Q4 or better projectile armed Ryfler (this is what they call troops in Quar world) can go into Overwatch if they have 2 activations to spend. This sets the unit aside for the turn, and any model that activates within the Overwatch model's LOS can be fired upon, but at a modified -1 to-hit cost. Also the Overwatch model has to fire at any model in that LOS, and the only way to resist is to perform a Quality Check. Aside from that, there's Crewed and Area Of Effect (AOE) weapons depicted, with rules detailing their usage, and Ranged and Melee combat is handled almost the same way as it is in other Ganesha Games. Essentially combat is a roll off. The one with the highest combined roll wins, and the Attacker/Firer uses their Combat value (+ any ranged, weapon or H2H modifiers) + the results of the dice roll. By how much you win also determines how badly you've beaten the defender down. Winning simply by an odd number forces the Target model to Go to Ground, but an even winning result forces the model to be Shaken. Doubling the Target's result forces the model Out of Action, and Tripling the Target's score altogether kills the model. However a few things are very different in combat versus previous Song of Blades titles. For instance charging a model armed with a ranged weapon can be quite dangerous, as the target is given the chance to roll to see if they can fire their ranged weapon at the charging foe. If successful the target can add their ranged combat bonus to the melee. So melee is a little different. Morale is a little different too, and some of the results from Ranged Combat are a little different. For instance in Fear and Faith doubling the target's score Kills and tripling counts as a Gruesome Death, but doubling the target's score in SOA counts as Out of Action, and tripling the score is a Kill. Ranged combat can get quite brutal too overall, and this is where it also has a little more in common with the WWI-era-esq motif. Pages 12-37 detail the bulk of the rules for the game. Starting at Page 40 and ending at Page 71 is where you'll find the armies that are depicted in SOA. Pages 40-47 detail the Partisians of the River Elgh, which is a group made up of Militia and Partisian Quar. There's a little bit of fluff, and then profiles are provided for every type of unit you can take in your army. Each of these sections show in full color what each uniform looks like, which is very helpful when painting Quar. Pages 50-59 covers the Coftyrans via profiles and pictures as well. And lastly Pages 62-71 covers the Crusaders force. 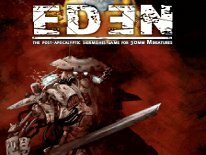 Paged 74-94 includes 11 unique scenarios you can play SOA out within, complete with full color imagery of what the board should look like, plus all of the rules and any special rules for victory conditions and what not. Tossing in 11 scenarios I thought was quite generous, as very few core rulebooks offer up much more than 5-6 usually. Nearing the end Pages 96-106 covers all of the Special Abilities, and Veteran Abilties in-depth defining each one. Lastly Pages 106-109 includes nice quick reference cards to use during play detailing all of the modifiers, and weapon statistics. As much as I've enjoyed the actual Ganesha Games published rulebooks like Fear and Faith and Song of Blades and Heroes, Zombiesmith has taken things to the next level with Song of our Ancestors in terms of rulebook design and presentation. The Ganesha stuff was always functional, and nice looking, so no complaints there. However the SOA rulebook is different, it's a higher quality production and I'm not one normally to get into the fluff and stories, but by presentation alone I was drawn into to SOA and the world of Quar. I instantly wanted to know more about the Quar the minute I thumbed through the book for the first time. As far as games go I can't say SOA is that much better or worse than any other Song of Blades games, because as a game it's pretty much the same game, with only minor tweaks. However the combination of Quar and the Song of Blades rules is a sure-fire winner if you happen to find the Quar intriguing at all. I've enjoyed it, and I have a new appreciation for the Quar because of Song of our Ancestors. All in all SOA is a fun little game to play, and there's enough of it there to play for a while, since they generously offer up 11 scenarios to throw your Quar into the thick of it. This is also one of two different games available for Quar from Zombiesmith. SOA is the smaller scale skirmish-game size product. On average a game of SOA is meant to be played with 500-points per side, which equals about 5-15 models (5 if you pick Elites, as many as 15 if you pick the peon types) per side. With the SOA rules the gameplay moves along smoothly, and an average game shouldn't take more than 45-minutes usually. The other product which is meant to be the larger scale miniatures rules for Qaur gaming is called This Quar's War, and it's not based on the Song of Blades ruleset. Cost-wise the printed softcover of Song of our Ancestors is a bit much at $30 USD, especially for only 109 pages worth of content. However it is a really nice book. I'd say that it's right up there quality-wise with some of the very best efforts from many other skirmish game publishers in this industry. And while the PDF version can be purchased directly from Ganesha Games for just $11.99 USD, which is a steal, it would cost you more than $50 USD to print the PDF off in full color at most print centers, so even at $30 the full blown softcover begins to not look like such a bad deal after all. If you appreciate all that is Quar, this is also a must-have book. Stay tuned for more on Quar as I'm still putting together my review of the Quar models in 28mm scale, and my in-depth review of This Quar's War as well. Both of which will be posted as separate articles soon. For the record Song Of Our Ancestors is based off of a version of Flying Lead which is a Ganesha Games product, written by both Rich Jones and Andrea Sfiligoi. However at the core all of these games Fear & Faith, Mutants and Death Ray Guns and Flying Lead share the same very basic mechanics as Song of Blades and Heroes, which technically was first. Flying Lead and Song of Our Ancestors just happens to be the two titles which are the most evolved rulesets for modern era weaponry, and also evolved ranged combat. Many of the illustrations throughout the book are also the work of Sequoia Blankenship.